The American Shakespeare Center (ASC) Winter Season: The Actors’ Renaissance began previews this past weekend of The Merry Wives of Windsor and Henry IV, Part 1. Shakespeare’s sitcom The Merry Wives of Windsor began previews Friday. Legend claims that Queen Elizabeth asked Shakespeare to write a play featuring Falstaff, the fat knight, in love. The objects of his affection, two clever Windsor wives, team up to outsmart and outmaneuver him. 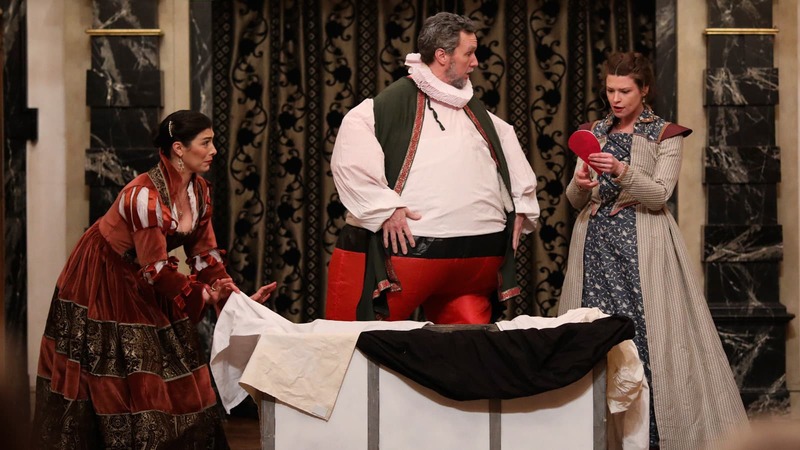 Merry Wives stars John Harrell as Falstaff, Abbi Hawk as Alice Ford, Meg Rodgers as Margaret Page, and Rick Blunt as Mistress Quickly. Now in previews, Merry Wives opens February 16. Pre-performance lectures are on February 24, March 17, March 22, and April 5. The thrilling and poignant coming-of-age story Henry IV, Part 1 began previews Saturday. Set at the onset of war, Prince Hal and Falstaff leave behind the brothels of London to defend King Henry’s crown in Shakespeare’s masterful exploration of family, friends, happiness, and honor. Henry is now in previews and opens February 15. A pre-performance lecture is on February 15. The Actors’ Renaissance continues with the SNC world-premiere title Anne Page Hates Fun by Amy E. Witting and Elizabethean true crime thriller Arden of Faversham (unknown authorship) opening in February. The Winter Season also features Chris Johnston, Katie Little, Shunté Lofton, Benjamin Reed, Calder Shilling, and Alexandra Stroud.